My 2nd day in Penang didn't kick-off as yummy as I hoped it to be :( I unfortunately had the worse char kuey teow ever in my life!! Can you believe it? Penang + BAD char kuey teow?? Quite impossible, right? If the PerutBesi says it's bad, it is realllllllly bad :S This is the result of not doing my homework before I set off for my solo trip. I relied VERY much on my friends to bring me around & introduce me to the load of good food! I'm all the way up north, but heck, Malacca's cendol rocks!! This was the so-called famous char kuey teow place - DISAPPOINTMENT! I didn't know that most people have boycotted this stall 'til I met my Penang friends after this horrible breakfast...sigh...I must remember to do my home-work! Can you believe it? RM7.00 for a plate of lousy fried kuey teow? What is so nice about it?? Some people have complained that the lady who fries the noodles is very rude, but I didn't order, thus I didn't realize. KK brought me there cos it was "well-known" & that's about it. I won't go back to this stall again...sigh...mine was too salty & er...'nuff said. I might get sued for this post! :P It must be a bad day for the lady or for the PerutBesi! You must try this place though. Moo Kata @ Lorong Burma beside the Siamese Temple! Simple place for good Thai steamboat + BBQ :) Lovely!! Sizzling hot goodness on the top, flowing into the soup! Oooo....yums! Another one of our favourites. If you're a pork-lover, this is a must for you. It tastes quite similar to the fish dish, but it's the yummilicious pork! You MUST NOT leave this place without trying their fried chicken. This was the BEST fried chicken that I have ever tasted. I loved the fragrance of the fried wings + the crispy-ness! The chef used 3 types of flour for the batter & he only marinates the wings for 2 hours (not more, not less). It's a revolutionary deep-fried chicken wings! Stay tuned for posts on Kampar & Ipoh!! I'm finally back from my trip!! Sorry for the delay in updates. I didn't have the internet access & I was busy with job applications! Anyway, here's more on my solo trip for all my readers out there ;) Enjoy! Penang, Malaysia's "land of good food up north"! I felt that I did more than I have expected myself to do during the short trip up here. Firstly, I had a good catch up with my best friend, GN, who happened to be here to visit her sister. Then, I also had a much-awaited catch up with my high school friend, KK 'til the wee hours of the morning. I had lovely food & not-so-lovely food as well...and the bonus, I met up with a great bunch of Penang food bloggers for a restaurant review! *fwah* Syiok ar! This was my 1st meal. I followed 2 friends up north as they had to be in Penang for a function. Since they stayed at Tune Hotel, I thought some yummy yam cake would start-off my eating adventure in Penang! What's so good about this yam cake is basically the toppings. I've had better yam cakes back here in PJ, specifically Subang SS19 :P The fried dried shrimps + fried shallots generously topped onto the yam cake makes the yam cake extra fragrant :) Try it & you'll know what I mean. I won't say that this is the best yam cake, but it is pretty good! I basically didn't do much on my 1st day in Penang. KK brought me over to Sunset Bistro to catch the sunset in the evening. He knew I'm quite a fan of such natural beauty, so lazing at the beach with some drinks & a pizza sure suits well for a relaxing holiday! I'm not a great fan of Mojito, but since KK ordered for me, I just gulped it down slowly...the pizza's nothing to shout about. Not the best, for sure! Have a break, Have some good food! Apologies for the the delay in updates! :( I'll only be able to get the updates done earliest late next week...I'm currently in Ipoh & I don't have my laptop to work on...just borrowing a friend's laptop for a while to get this announcement up. Do stay tuned with PerutBesi! I've LOADS of posts to share; food & places that I've visited from Penang, Kampar, & Ipoh too! Overall comment: AP said that the fried kuey teow here is quite delicious, but I felt that it was okay only. There was nothing very fantastic & I didn't feel hooked to it. On our way back from Colmar Tropicale to Kuantan, we stopped by this coffeeshop for some decent "char kuey teow". The aunty who was frying the kuey teow is pretty hard-working, working everyday from morning 'til mid afternoon. The kuey teow was thin & still chewy, not too soft/over-cooked. I'm not sure if it's the timing, but by the time we were there, the fried kuey teow didn't have any prawns. The noodles were not too oily as well, which was to my delight...overall, because I was hungry, this plate of lunch was acceptable...I'm just looking forward to my trip to Penang this weekend for some AWESOME Penang fried kuey teow! Another place that I would love to introduce to my readers is this burger stall at the Alor Akar area, near IKIP College. Their oblong burger kambing with black pepper sauce rocks!! For just RM4.80/burger, you'll get a mouth-watering mutton burger to die for! Eating at Colmar Tropicale is certainly expensive. If you're fortunate, you'll get decent-tasting food. My friends told me that the food at Colmar Tropicale is almost non-edible. To my greatest surprise, my food was alright! It's not the best, but it was acceptable :) *phew* Thank God! 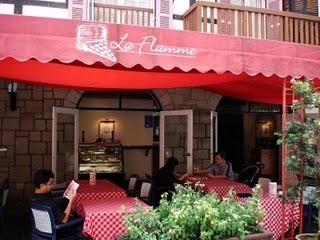 On our first night at Bukit Tinggi, we decided to treat ourselves to some delicious & cheap Chinese food at Kampung Bukit Tinggi (the village not too far from Colmar Tropicale), while on our 2nd night here, we just had dinner at La Flamme, a pizza & pasta restaurant. As you approach Kampung Bukit Tinggi, you'll see a row of shops in front of you. Turn right, heading towards the village. Drive pass a wooden bridge. Once you pass the bridge, you'll see long, unkept grass/"lalang" on your left & right. You'll pass by 1 open-spaced restaurant on your left. Right after that 1st restaurant, look out for the restaurant's signboard on left. Turn left into the small un-tarred pathway. You'll see the restaurant on your left. There's a fish pond, a large parking area, & the restaurant itself. Great as a snack or as one of the main dishes, this dish is certainly appetizing! The sauce is slightly sweet, like honey, coating the crispy pork slices. *crunch* Ah....yums! You'll rarely get this vegetable in PJ/KL. I just enjoy chewing on the thick, succulent leaves, which are slightly slimy. It's alike the lady's fingers & the "san choy", commonly used in soups with salted egg. This vegetable is also said to be good for health (what the Chinese call as "pou"). Overall comment: Acceptable pizza & pasta at prices that won't burn too large a hole on your pocket. Taste isn't all that great, but decent enough to fill your stomachs. Some friends told me that the food here is really terrible, but when I was here last weekend, it tasted alright. Perhaps they changed their chefs? This restaurant is also one of the many restaurants here that are packed with hungry tourists every lunch & dinner. Strange how some restaurants are SO quiet, while some have a queue! Out of all the many eateries at Colmar Tropicale i.e. La Boulangerie, La Cigogne, Ryo Zan Tei, & La Flamme, we decided to have our dinner at the La Flamme; mainly because of the price (it's somewhat more worth it to pay RM30+ for pizza & pasta than for 1/4 roast chicken, or paying more than RM40+ for some French fine-dining dish) & the aroma of freshly baked pizza just tempted us to drop by for a meal. Reasonable variety of pizza, pasta, salad, & soups. All prices are subject to 10% service charge & 5% Government tax. AP told me, "That mak cik is cooking your pasta...." Eeee...hahahaha...I really lack faith at the 1st impression of the chefs in the kitchen. Each regular/large pizza is divided into 8 portions. [Ruth] I didn't try this pasta, so I can't really comment. By the looks of it, it doesn't look very interesting...hahaha...but my friend who had this pasta said that it tasted alright. [Ruth] The pasta sauce lacks "umphh" & the seafood wasn't very fresh. This dish could afford more herbs though...really lacking in flavour (though still edible). I reckon I could cook a better pasta marinara...and spend less on getting all the ingredients too! If you're planning to settle for a meal at Colmar Tropicale itself, be prepared to spend a little more than the usual. Don't expect too much from the taste of food there as well, lest you'll be greatly disappointed. My friends & I actually saved a lot 'cause we bought loaves of bread & cans of tuna for our lunch. It sounds rather pathetic for a holiday, but hey, we actually enjoyed ourselves with our humble tuna sandwiches over a cup of coffee/Milo (brought there ourselves) in front of the T.V. We splurged on breakfast & dinner at Kampung Bukit Tinggi/Colmar Tropicale, & on the mount of junkfood too! Stay tuned for one more post on my Kuantan trip ;) More food to come! !